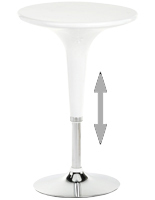 Tall cocktail tables easily set up and breakdown between events! 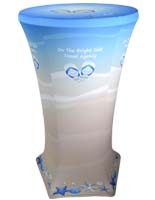 Round HDPE plastic top is resistant to many damages! 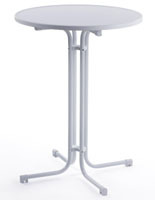 Tall tables accommodate small gatherings of guests during a cocktail or coffee hour! 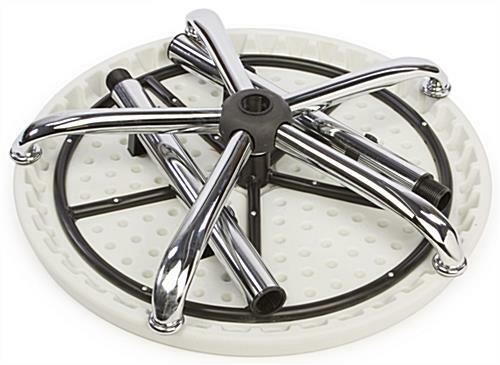 Sturdy steel stand and fan legs provide stability! 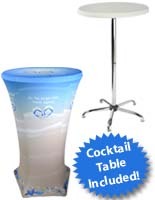 These tall cocktail tables that stand 47" high are an increasingly popular piece of furniture at various events. The round highboys are seen everywhere from wedding receptions to corporate functions or trade shows. 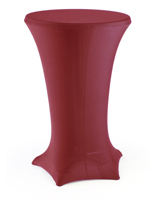 Plastic tall cocktail tables, also known as party furniture rentals, are an excellent alternative to formal, sit-down dinner service, providing a more casual and relaxed atmosphere. Incorporating highboys into an event allows guests to walk around, mingle and network more freely than with traditional seating arrangements. 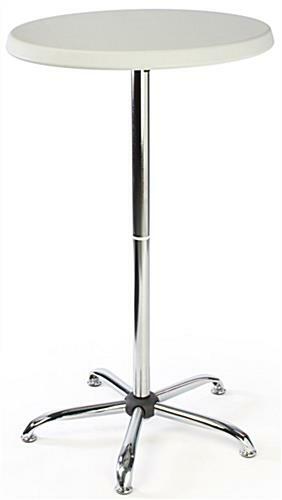 These tall cocktail tables with steel legs are a great purchase for catering companies or banquet halls. In addition, event coordinators or businesses may choose to buy the furniture, rather than using simply as party rentals. The tall narrow design of this plastic furniture enables party planners and event coordinators to place more units within a room without crowding the space. 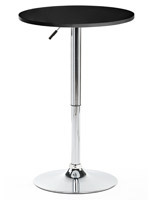 If need-be, these tall cocktail tables can also be quickly disassembled and stored in a closet or small storage area. Buy this plastic furniture in bulk quantities for big savings! 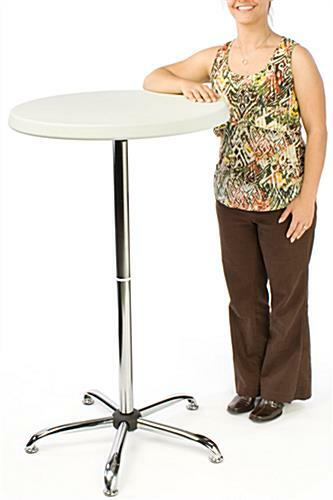 These 27" round displays, tall cocktail tables that are built to last are crafted from durable steel and high-density polyethylene plastic. This event furniture looks great when covered with stretch or flowing tablecloths, designed to match the theme and color scheme of a party or coffee hour. 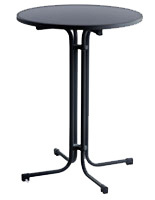 These tall cocktail tables ship unassembled for reduced shipping costs and can easily break down for storage when not being used. 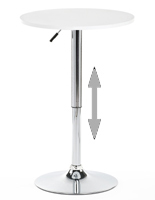 To assemble the round furniture, users simply need to screw the four main parts (fanned-leg base, 2-piece stand & light grey speckled tabletop) together. One person can easily assemble these tall cocktail tables with little effort. Some basic tools may be required to complete the assembly process. 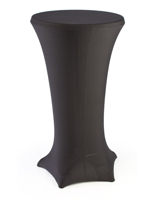 These tall cocktail tables will add contemporary flair to the next big affair! These tables are great - easy to setup/breakdown/store. I've ordered several in the past and will again. This particular one, however, had a split in the side of the bag that holds all the screws/feet. Screws were loose in the box and one was missing.